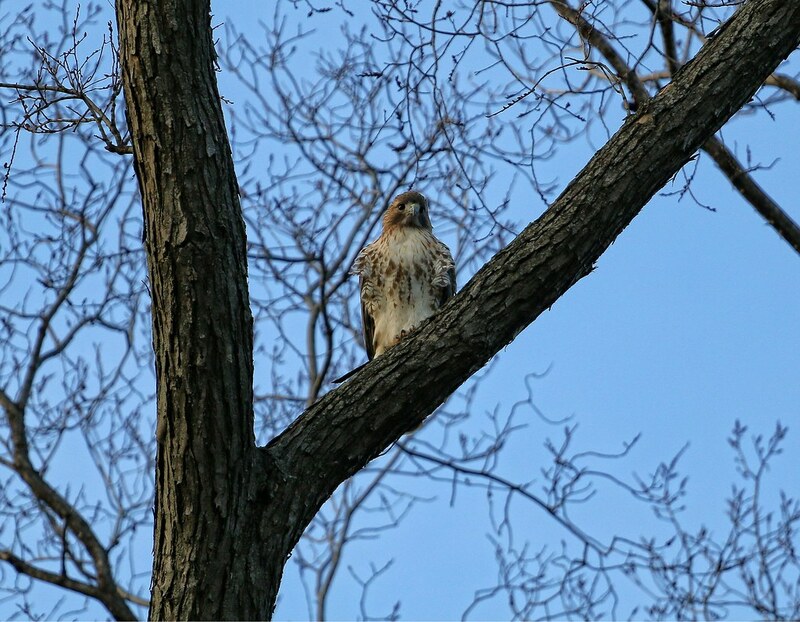 Sunday was a busy day for red-tailed hawk, Christo. 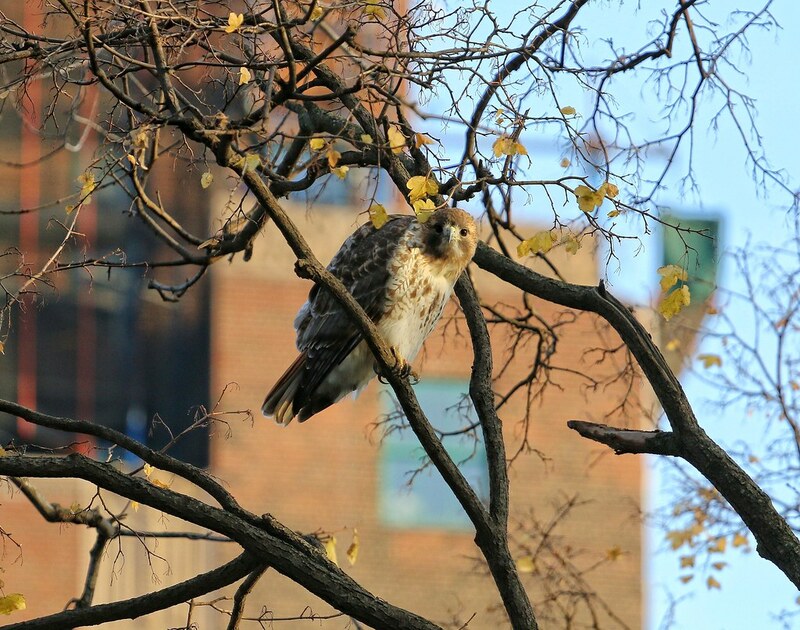 When I arrived in Tompkins Square, he made himself known within minutes by landing in a tree right in front of me. After appearing to hunt pigeons on the west side of the park, and then on the east, something grabbed his attention and he started calling. 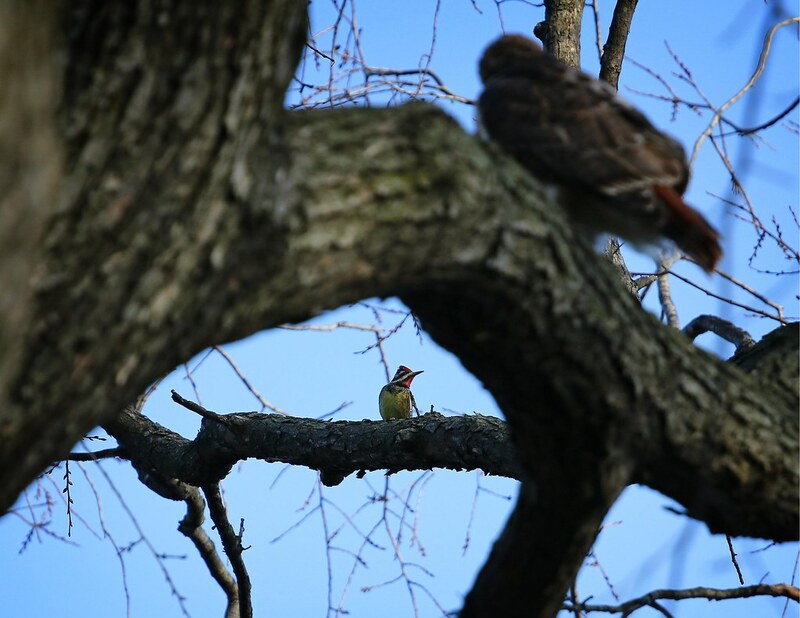 High in the sky over Avenue B, Dora (below, right) was sparring with an intruding juvenile red-tail (below, left). She seemed to be handling herself just fine, so Christo remained in the park, but stayed vigilant. A short while later, a juvenile Cooper's hawk flew through the park. This was the second Cooper's sighting of the day. After spotting the hawk, Christo took off east, in the direction it had gone. In my previous post, I noted that Dora is usually the one I see doing battle with intruding hawks. This time, I watched as Christo and the Cooper's got aggressive with each other high up over Avenue B and 3rd Street. In the photos below, the Cooper's is on the left and appears to be chasing Christo. I lost sight of them when they headed south and then west, behind some buildings. 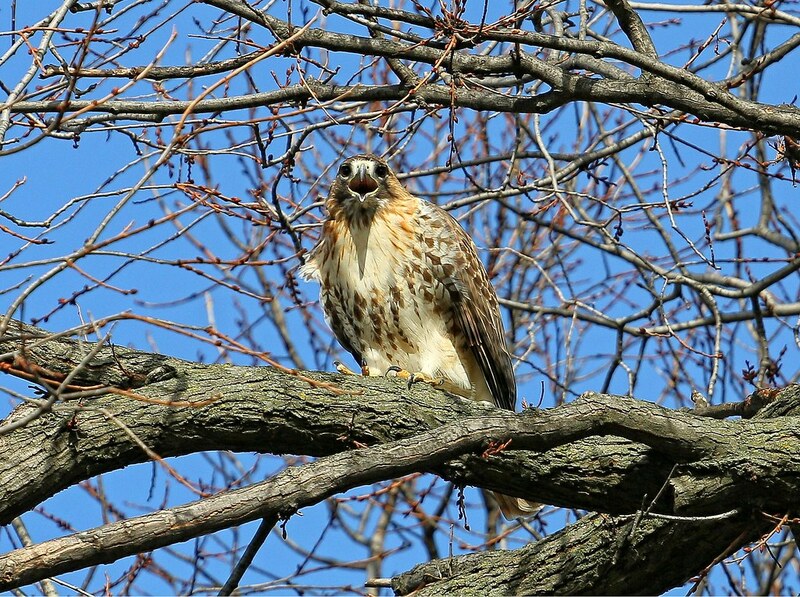 Over the last few weeks, the red-tails have been highly tolerant of the Cooper's hawks in their territory, so I don't know why Christo lost his patience this day. 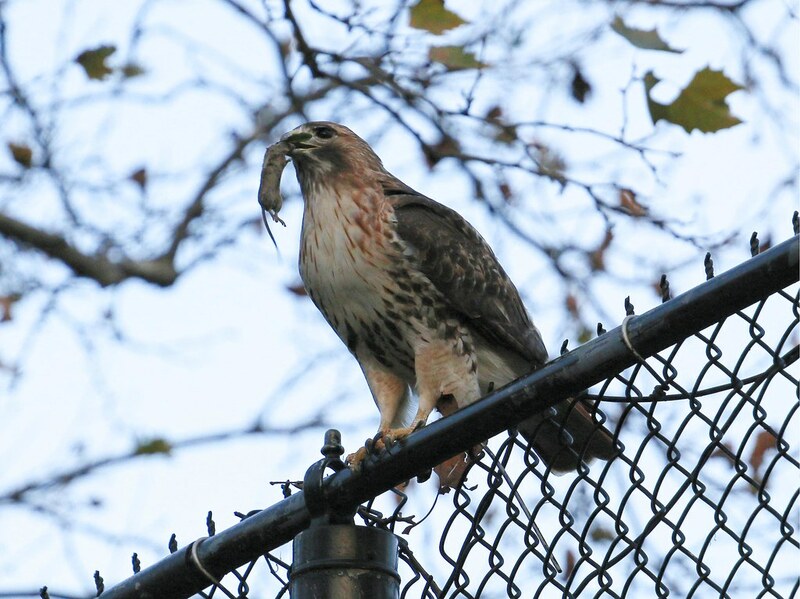 Maybe the red-tails have been too lenient allowing the Cooper's to take food from their territory. I can only speculate. Just before sunset, Christo returned to his usual post on the flagpole outside the park offices. 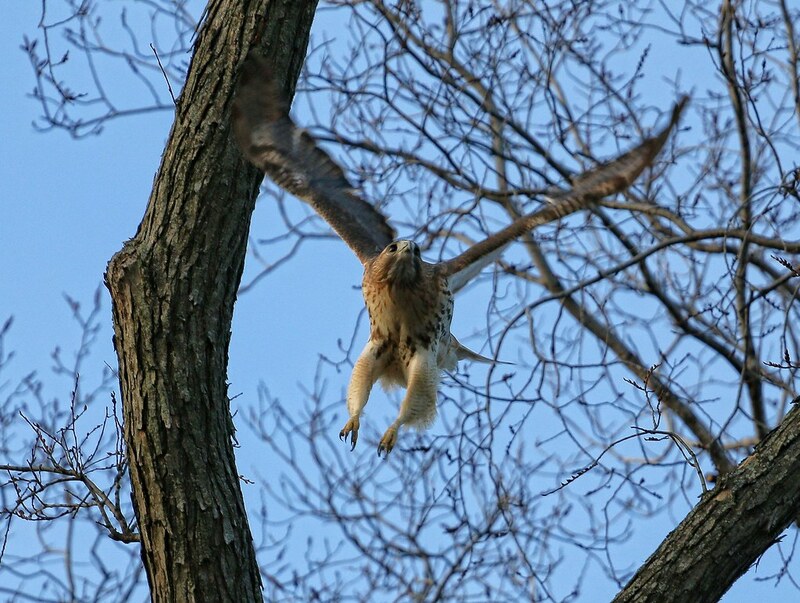 From there, he flew behind the bathrooms where he had a showdown with a Yellow-bellied Sapsucker. When Christo eventually flew off, I lost him. 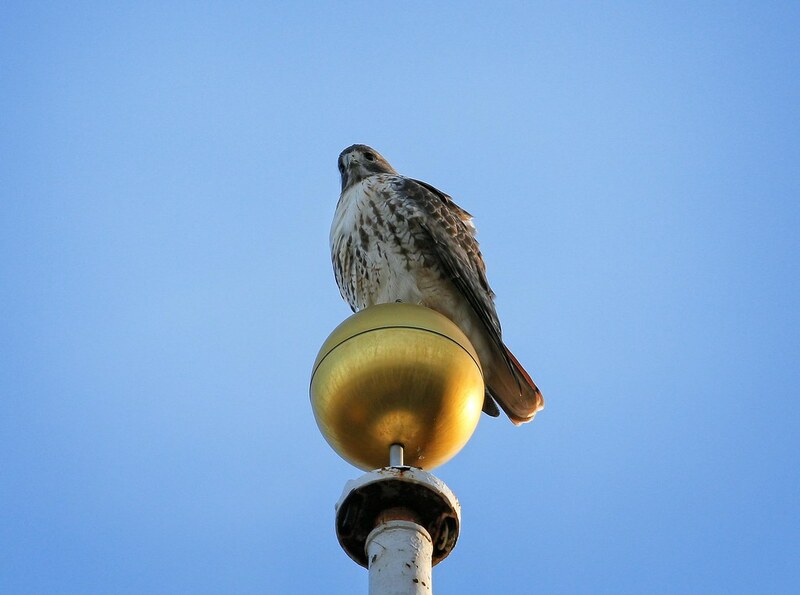 So, I went to see Dora, who was perched on the cross at St Nicholas of Myra church on Avenue A and 10th Street. I could see that her attention was focused on something to my right. Just at that moment, a commotion broke out on the street and people were snapping pictures with their phones. I turned to see Christo about twenty feet away on a fence with a mouse. I'd been standing there looking at Dora and completely missed Christo making the catch! He ate the mouse in less than five minutes and still looked to be hunting. I wondered Dora was expecting him to catch her some dinner, or if he was still hungry. Thanks to a very effective rat control program in the park, there haven't been any big rats to catch since early summer, so seeing Christo catch a rodent at all has become a fairly rare event. As it got dark, the hawks were still active, but it became too difficult to see them flying around the park. I've been wondering if the hawks have been doing any hunting after dark. They are diurnal birds, but I've seen Christo catch rats after dark before. Now that the rat population in the park is greatly diminished, perhaps the hawks have had to adapt and have extended hunting hours in order to have the best chance of finding rats as they emerge from their burrows in the evening. Again, this is just speculation, but is something I'm trying to determine. 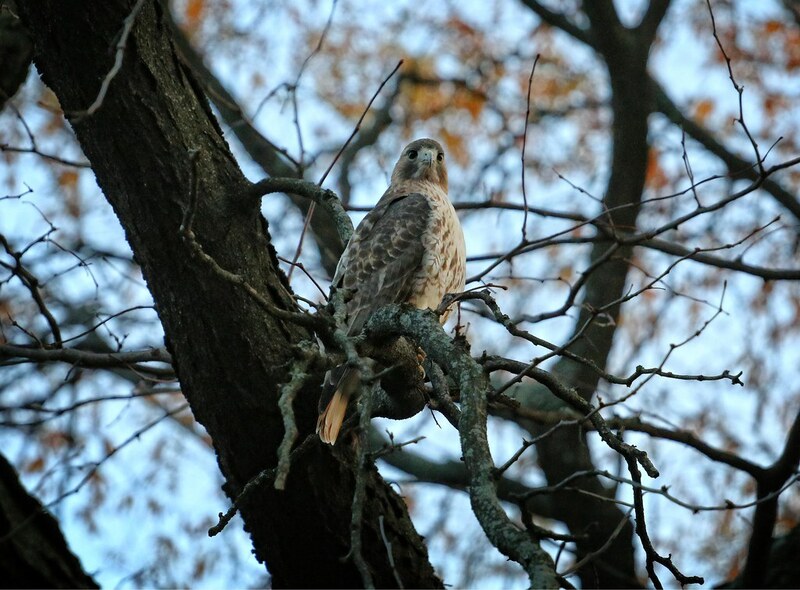 See more recent hawk photos here.